Everyone knows it can be tricky to get our kids to get all the vegetables they need for their growing bodies. I’ve become quite good at hiding certain veggies into dishes that way they have no idea they are getting a serving full of ‘disgusting vegetables’ :)! This pasta sauce is incredibly delicious! It’s on the sweeter side which I think really helps appeal to kids and their taste buds! Pair it with salty garlic bread and you have a winner! In a saucepan, heat the olive oil and saute the onion and garlic until translucent. Add in the ground turkey, season with salt and pepper. Cook the turkey all the way through and cover with the pasta sauce. Stir and let simmer. In the Magic Bullet Blender add the sweet potato and milk and puree until creamy. Stir that into the pasta sauce mixture. Add seasonings, stir, and simmer. Serve over cooked pasta and enjoy! I love to make up different flavors of popsicles for my girls during the summer. They LOVE those brightly colored popsicles, and they could eat 10 if I let them. These are filling, subtly sweet, creamy, and have the pop of bright pinkish red raspberries that kids will love! In the Magic Bullet blender, add all of your ingredients, minus the raspberries, and blend until smooth. Pour your ingredients into a popsicle mold leaving a little bit of room on the top. Place a few raspberries on the top, then stick your popsicle stick in the mold. Freeze for 2-4 hours, or until ready. My youngest is one of the pickiest eaters, but I can always get her to eat donuts. She loves all sorts of flavors, so I have a lot of fun coming up with new and healthier ways to get her to eat! These donuts come together so quickly which is always a plus! Preheat oven to 350 degrees. 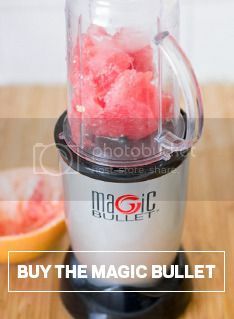 Add all of the ingredients to the Magic Bullet blender and blend until creamy, about 1 minute. Grease a donut pan and then pour the batter into the donut pan. Top with chocolate chips, optional. Bake for 10-12 minutes. This is a great ‘sunrise’ smoothie that you can enjoy after your morning workout, or a little bright pick me up! Or, if you are in a really good mood…A nice big scoop of coconut milk ice cream would make a rather nice addition ;). Add all of the ingredients into the Magic Bullet Blender and Blend until creamy. Drink immediately and enjoy! Summer means s’mores, but if you live in the desert in the summer then making s’mores over a fire is not the best idea! So these baked s’more bars are just as fun to eat, and you won’t have to sweat it out over a hot fire! Preheat the oven to 350 degrees. Add the graham crackers in a ziplock bag. Crush them lightly then add them into the Magic Bullet Blender. Blend them until them are fine crumbs. In a bowl, whisk together the flour, 1/4 cup of the graham crackers crumbs, cornstarch, baking soda, and salt. Set aside. In another bowl, beat the butter and sugar together until combined. Add the sugars, beat together, then the eggs and vanilla. Beat together the flour into the butter mixture until combined. Grease an 8×8 glass pan and add the batter to the pan. Press down firmly, then press in the rest of the chocolate. Sprinkle 1/4 cup of graham cracker crumbs on top and press those in too. Bake for 20 minutes, then remove and let cool. Serve and enjoy! My mom used to make this for me as a kid all the time, and then she would spread it onto a sandwich and cut in into tiny squares. It always reminded me of tea party food, and I loved it. It’s a great twist on a sandwich, and the recipe today puts a little more grown up twist on this tea party classic. In the Magic Bullet Blender, add all of the ingredients together. Spread on a sandwich, toast, or whatever you desire! Smoothie bowls are one of my favorite treats! It’s my own version of build your own ‘fro-yo’, because I can add whatever topping I would like to a creamier/healthier ice cream base. I usually always go with chocolate :). Feel free to adjust the flavors and toppings accordingly! One topping I used were cocoa nibs, which is an all natural form of pure cocoa, but I would definitely be ok with chocolate chips as well! In the larger blender of the Magic Bullet, add your smoothie ingredients. Blend until creamy. Add more milk if needed to blend easier. Pour into a bowl, add toppings, and eat immediately. In the Magic Bullet Blender puree the avocado until smooth. If needed, add a tsp. of water to help blend. This may take a few minutes to blend as you might need to use a spoon to stir the avocado every so often. Next in a separate bowl, mix together the flour, sugar, and salt. In a saucepan add butter and melt. Then stir in cocoa powder and boiling water or coffee. Stir until creamy, remove from heat and pour over the flour mixture. Whisk together and set aside. In a separate bowl add the buttermilk, eggs, vanilla, and avocado. Whisk together until combined. Add to cake mixture and stir until combined. Grease a cake sheet pan and add mixture. Bake 250 for 20 minutes. Right before the cake is done, make the frosting. In a sauce pan melt the butter. Stir in the cocoa powder and turn off the heat. Whisk in the milk, vanilla, and powdered sugar. Once the cake is done, pour the frosting over the warm cake and spread. Enjoy! Soup is always a hit or miss with my kids. If there are vegetables or green stuff in their soup chances are it’s a no for them. No matter how many cheesy grilled cheese sandwiches I make as a side… they still aren’t having it. Then it hit me one night when they scarfed down their mashed potatoes that I’ve never tried making them potato soup. Liquid mashed potatoes! To be honest, I don’t love potato soup, I would much rather have a broth loaded veggie soup, but with just a touch of pesto and cheese, these soups have become my favorite! I won’t lie, a grilled mozzarella and tomato sandwich paired alongside doesn’t hurt either. Oh, and if you have kids, go ahead and leave out the pesto..because it’s green and you know how kids are with green foods! In a large pot, heat the olive oil on low/med heat. Add the leaks, stir occasionally, and cook until softened. Add the potatoes, stir, then add the broth and milk. Bring the mixture to a boil, then simmer on low until the potatoes have softened. Let soup cool to room temperature. Never put anything hot in the Magic Bullet. Using the large cup for the Magic Bullet Blender, ladle in the cooled soup to the blender in batches, and blend until creamy. Return blended soup to the pot to reheat. Thin with more milk if needed for a desired consistency. When serving, add 1-2 tb pesto swirled in to the soup, then top with parmesan cheese. Enjoy! My girls love anything ‘pink’ so when I was making this chia pudding they kept asking for it to be ‘pink’. Thank goodness for red ripe strawberries, because this its their new favorite treat! Plus blending it smooths out the chia seeds so it’s not a weird texture for the kids! In a Magic Bullet Blender add all of the ingredients and blend until creamy. Pour into a dessert glass and refrigerate until set, about an hour. Top with additional strawberries and chopped chocolate. Enjoy!